You really don’t want to wait until disaster strikes! You can bet I can feel with your pain. I’m an IT guy, I’ve been there, I’ve pulled clients from the brink of disaster more than once. In those days I was never without a backup but a server crash was still ugly – and very costly for my clients. But that’s changed now. Technology is advanced enough that recovery can be quick and practically pain free. It just takes some planning and a bit of ingenuity. More on that later though. The fact is, if you’ve been down the “network down” road, you don’t want to go back and if you haven’t, you don’t want to! Your IT guy has likely talked to you about break/fix, managed services, monitoring, remote support… you know, all that mind numbing jargon. The reality is, you can risk your business, pay a fortune for some peace of mind, or let your IT guy think outside of the box. They are computers after all: there are tons of options. What you don’t want though is to leave it until it’s too late. Keep trusting your backups and hope like the dickens that if something major happens, you’ll be able to get back on track in reasonable time. For a monthly fee for each of the computers and devices on your network you can have proactive, all-you-can-eat service. This will be hundreds of dollars a month if not more. I have a system that can get you back on your feet with only minor downtime (an hour or so) in the event of major disaster and will take backups all day long while you work. Far less expensive than managed services and far less damaging to your business when things fall apart. 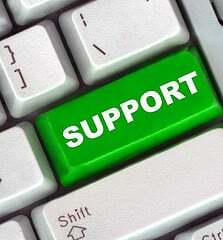 Couple that with excellent IT support and you have a magic mix of old school break/fix and peace of mind. I may not be a fit for your business, or I may be exactly what you need. Give me a call or visit my website and let’s find out now, before your business is in crisis mode.